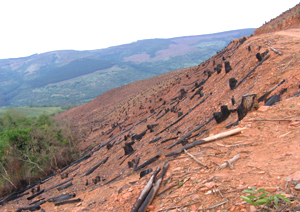 The undersigned wish to urge members of the Forest Stewardship Council (FSC) to urgently resolve the serious problem of FSC certification of monoculture tree plantations, at the FSC general assembly to be held in Cape Town, South Africa. One of the topics for discussion at the general assembly is a Review of FSC Principles and Criteria, and there is therefore an opportunity for changing those principles in such a way as to exclude the certification of monoculture tree plantations by FSC. FSC members –particularly from the environmental and social chambers- must be made aware that certification of that type of plantation is not only eroding the FSC’s credibility but –more importantly- that it is undermining local people’s struggles against plantations. Those peoples are struggling to protect the same things that FSC members from environmental and social organizations agreed needed to be protected when they joined the FSC: indigenous, traditional and peasant communities’ rights and livelihoods; forests, grasslands and wetlands; water, soils and biodiversity. All large scale tree plantations impact heavily on most –and usually all- of the above. There is now more than sufficient documented evidence of those impacts in a large number of countries, ranging from South Africa and Swaziland to Brazil, Colombia, Chile, Ecuador, Uruguay, Spain, Ireland and others. The obvious conclusion must be that large scale tree monocultures are uncertifiable. In spite of that, time and time again FSC-accredited certifiers have awarded the FSC seal to them. Little has mattered that those plantations were being opposed by local communities and that the FSC label would result in further strengthening already very powerful companies whose activities are destroying Nature and peoples’ livelihoods. Four years after having launched the FSC Plantations Review, nothing has changed. In spite of abundant documentation demonstrating the negative social and environmental impacts of plantations, there are currently at least 8.5 million hectares of plantations already certified, as well as an unknown area within the 37.7 million hectares grouped under the category “semi-natural & mixed plantation and natural forest”, which hides a large number of plantations. The time has now arrived for FSC members –particularly from the social and environmental chambers- to take sides: to continue to allow business as usual, or to fight for change; to protect the interests of large pulp and timber corporations or the rights of local peoples and Nature; to carry on accepting that plantations are a “type of forest” or to agree that they have nothing in common with them; to greenwash a most harmful land-use, or to oppose social and environmental destruction. We therefore call on those FSC members who share with us the desire to protect local peoples and Nature from the damage caused by the expansion of tree plantations to raise their voices at the upcoming general assembly and to help bring about the change that is needed.